A Tray of Bliss: A Homespun Year.....as the year draws to a close...what was achieved! A Homespun Year.....as the year draws to a close...what was achieved! I commenced 2016, declaring it my year of all things homespun. The word 'homespun' conjures up the beautiful, the warm, the giving, the hugs and love, the learning, and the failing. This year, I've learned a great deal. I've pushed myself to adopt at least one new skill, or money saving strategy each month. I've shared my successes, and even a few that weren't so successful, with you all. I hope I've encouraged you to, in Aussie lingo, to 'have a go'. Because really that's what it's all about. Anyone can throw a bit of cash around and find a random pretty. It takes a certain kind of determination and persistence, to craft a skill that's good enough to gift, and even more, to admit that the skill is a work-in-progress, and gift it anyway. This year, I made Goats milk soap, seen above, and rustic Gingerbread cities, seen below. I wish I had the energy to share how I made them, and maybe early next year I will. Suffice to say, if I never make another one, I'll be happy! In short though, if you're really curious, I used a fitted sheet, fitting it to a spare mattress to hold it firm, and pinned multiple layers of tulle that I'd pre-stitched for a rainbow effect to it, in the appropriate spot. I then wrestled the lot through my long suffering sewing machine. Not hard, but fiddly. Cake baking and decorating was taken to another level, cupcakes frosted and decorated with little North Pole signs seen above, and my first attempt at a Christmas Bauble cake, seen below. Now THAT was a challenge! I'll be trying that one again next year, and perhaps not choosing red edible glitter with which to embellish it. My husband commented wryly that it looked like it had been injured...whoops! All the same, you try smoothing buttercream and fondant onto a sphere...it's jolly hard! So I'm proud as punch! Hahahaha! and a Tie Dye batter cake, which was very pretty! The term 'Jamberry Nails' found it's way into my vocabulary, saving me time and money in the process. These little decorative vinyl stickers are heat activated and bond to the nail, lasting up to three weeks! At $11 for a mani and pedi, and ready to go as soon as they're applied, I'm a fan! 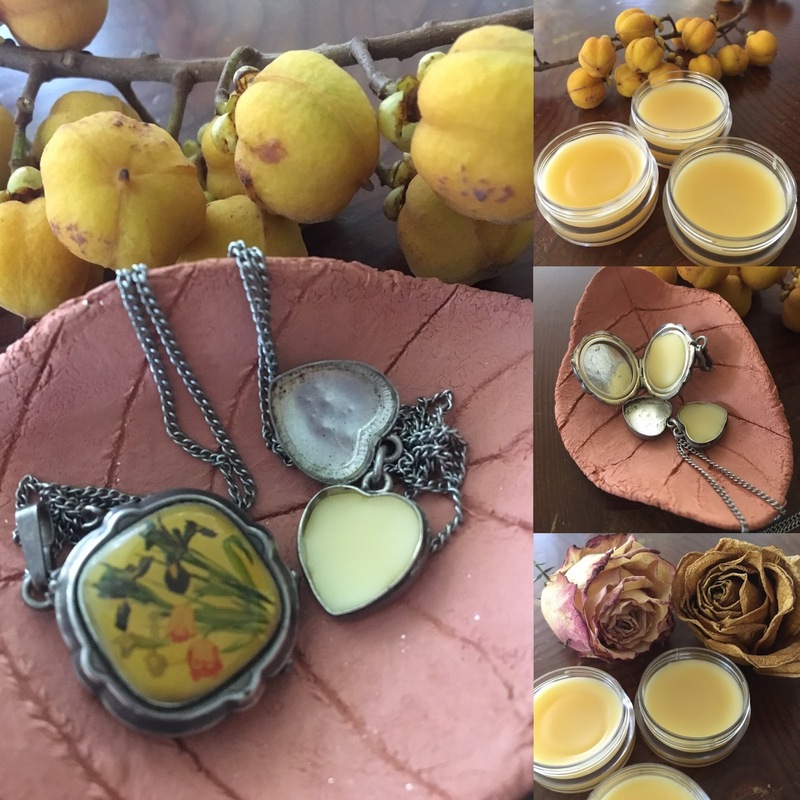 ...made solid perfumes in vintage lockets..
See how to package for a luxury presentation and feel here. I trained my daughter, now nearly 17, to cut her own hair, and mine, using a Creaclip. Thousands saved, and no more tears because the hairdresser didn't listen when I said 'don't cut off too much, because curly hair bounces up!'. Earlier in the year, I taught myself how to make Petit Fours and treated many friends to a lavish High Tea at low price. These dainty pink jelly cakes are simply bought sponge cake, cut into diamond shapes, dipped into chilled but not set jelly (jello), and rolled in dessicated coconut. Add a purchased sugar rose and who could imagine a prettier treat? ...I finally found time to adopt an Heirloom skill...smocking...one of which I'm very proud! Candle making was big as a gift here too. Who would have imagined that little scented candles in thrifted sugar bowls could look so adorable? At the behest of a favourite teacher, I learned how to make textile fibre collage, and managed to embellish several ghostly costumes for a spooky dance routine. This was far too complex a project to share as a tutorial. Rather I confined myself to showing you all some pretty pictures. Maybe next year, when I'm more adventurous. Or rather when I have more time! It's kind of fun! And new ways to organise all the paraphernalia that affords us the materials with which we work to create all this loveliness, were sourced and put into action. My instructions for these lovely lace organisers is here. This is just a portion of what I actually generated and gifted or donated this year. I do not photograph every single project, meal, costume, garment or cake I create, nor have I shared everything I've blogged here. However, these are my favourites, and the ones of which I am most proud. My aim has always been, to simply show you that things do not have to be perfect to be loved...or lovely. And that simply by starting somewhere, anywhere, that you too, can find the skills to create your own store of beautiful gifts, and a special expertise that is welcomed by your friends and family for any occasion. I hope I've accomplished that much. As an aside, my newly honed skills and projects, have saved my family, and my friends and loved ones, thousands and thousands of dollars this year. A cake can be anything from $100-$600, a large dreamcatcher sells at our local homewares store for $175, designer candles are $60-$120, Goats Milk soaps sell for $7-$17, a jar of Gingerbread? $45 please. Dance costumes...$100 each and I was a big part of creating over 200 this year. Haircuts, manicures, pedicures...well that's over $1000 saved right there. And so it goes. I'll be sharing a grand total next week, and I think like me, you will be amazed at how much it is! 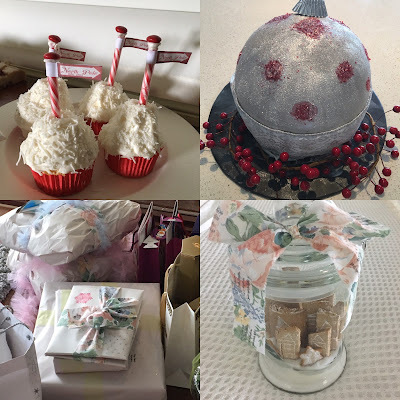 For more ideas and tutorials, please go to my tabs at the top of my page here, marked 'Celebrations and Gifts', 'All Things Homespun', and 'Budgeting and DIY'. I hope you'll find something to inspire you. Is there something you'd like me to share next year? At the start of 2016, I invited you to join me on my road to a Homespun Year. Did you take up the challenge? What new skills did you adopt? Are they still a work in progress? Or are you perhaps good enough to make some extra pocket money from them? I'd love to hear from you. Please share your stories. Ooh, Mimi, I must have missed the edible glitter post during the year - and guess what my 12yo baker child asked me for this afternoon? Yes, edible glitter! Thanks so much:) What an amazingly productive year you have had. Glorious and beautiful!! I'm so inspired by you and others to get with it in 2017. I often think I'm too old at 54 to learn so much, but I don't care! It looks like too much fun to pass up! You've certainly done your part to make this world a more beautiful place! What a busy lady you have been! I clicked on the one for the book weights to keep your book open and it takes me to the glitter sugar. I was wondering what you used to stuff the weights with? Thanks. Gorgeous work Mimi. The dreamcatchers are something that I am going to have a go at next year. I want to crochet a mandala to go in the ring. My next challenge is to learn to present the gifts as something very special. Merry Christmas. Oh Mimi, I am so inspired by the highlights of your past year. Every one is just beautiful! Isn't it fun that we live in the age of digital cameras and can record our projects so easily? Awesome Mimi! You got a lot of wonderful projects done! Thanks for sharing at Home Sweet Home! Thank you for sharing all your creative efforts - please move in next door to me!!!!!!!!!!!!! I hope you & the family have a wonderful holiday season and am sending good thoughts from the USA! "Oh, I remember when Mimi shared that." "How cute! I'd forgotten that one." "I really do need to try those." Merry Christmas, Happy New Year, and thanks for the good fun!